There are a number of different types of wheelchairs and scooters. Choosing the right type of scooter or wheelchair is important, as the device you end up selecting will play a significant role in your daily life. Below you'll find some helpful information that may prove beneficial in your search for a suitable chair. If you have any questions regarding what type of wheelchair is best for you, we'd be happy to help you make a decision at Dynamic Repair Solutions. To speak with one of our representatives, simply contact us today! If you enjoy a relatively large degree of mobility and have minimal needs for assistive devices, then a wheelchair or scooter may not be necessary. In such cases, assistive ambulation devices such as walkers, canes, and crutches may satisfy your needs. Require only temporary assistance for transportation. These types of devices are designed to provide mobility assistance to non-powered wheelchairs. If your needs can be met by a non-powered wheelchair the majority of the time, this type of device may be best for you, as it can provide you with mechanical assistance in those instances when it's required or beneficial. There are a wide variety of power wheelchairs and scooters but the one common thread between all of them is that they provide ample mobility and freedom of movement. If you are interested in getting a power wheelchair or scooter, we recommend speaking with your insurance provider to see what your options are, as it may be possible to get one for little to no money out of pocket! 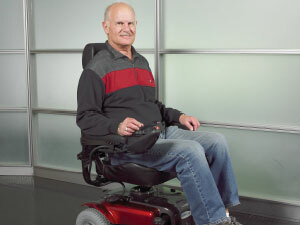 We can help if you have questions on what type of wheelchair you should choose. We understand our customers' needs and how to best suit them. Please don't hesitate to contact Dynamic Repair Solutions today – we'd be happy to help!